There comes a time with any house when it is time to look not just through the windows but at them and think about replacement. The installation of new windows can improve the energy-efficiency of your home, but changing the style of windows can also have a major impact on the appearance of your house. Two of the best candidates for a refreshing new window are bay and bow windows, but how many people know which is which? We are going to outline the differences between these two window styles, where each one works best, and the total cost for each to help you decide which one is right for your home. Bay and bow windows both protrude from the outside wall of the house with a corresponding ledge or alcove on the interior. They also both have more than one section fitted together as one unit. However, there are very clearly defined differences between the two. A bay window 1 is composed of three windows set at angles, with the center one usually wider than the two at the sides. 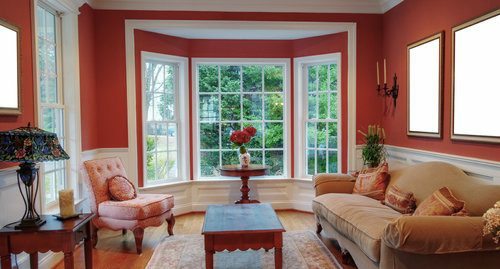 Often, the center window is a fixed picture window 2, while the side windows may be casement or double-hung. It can be an effective design note in either a modern or historic house. In contrast, a bow window is made up of four to six windows set side-by-side to form a curved structure. A bow window is usually wider than a bay window 1 because of the number of individual windows. However, it does not stick out as far on the outside or form as large an alcove as a bay window 1. It is especially appropriate for a Victorian-style house but can also be a great addition to a modern home. There are many excellent window treatments available for these windows. You can hang a Roman or Venetian blind in each individual window, for example, or hang a curtain which will screen off the entire window and alcove at once. Because of the size and shape of these windows, you may have to order custom window treatments, which can increase the price of decorating your new bay or bow window. Bow and bay windows 1 both let in a great deal of light, but because of its curved shape, greater width, and additional glass, a bow window allows more light and provides a broader view of the outdoors. Even a small bay window 1, however, will brighten a room more than a flat window. This makes both these window options an excellent choice for a living room, kitchen, or dining room where more sunlight is desired. In a bedroom, where complete darkness is usually desired for sleeping, a flat window that can be easily screened with window coverings may be a better choice. It is problematic to have windows that open in a bow window. Because they are set so close together, the opening mechanisms must be carefully placed so that they do not interfere with the elegant, curved look. For that reason, it is usually best to have fixed windows in a bow window. On the other hand, the side windows of a bay window are often either casement or double-hung, allowing for the versatility of letting in fresh air without interfering with the look of the window. Installing a bay or bow window is a bigger job than replacing a flat window, but even between those two styles, there are differences in the size of the job. 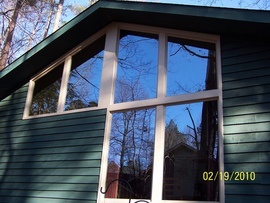 Because of its larger size and weight, it is harder to install a bow window. However, both styles of windows can be a challenge for a DIY installation. Often, the existing window opening will need to be enlarged and framed, and supports for the increased weight of either style need to be carefully planned so that they are both effective and attractive. Unless you possess super-handyman skills, it is best to call in a professional for this renovation task. Obviously, there are differences in labor costs depending on where you live, but it is possible to make a comparison between bow and bay windows to get an idea of which will cost you more. A 5-panel vinyl bow window will cost an average of $3,600 for materials and labor. An 8-foot vinyl bay window, on the other hand, will cost on average $2,600 for materials and labor. The cost of a bay or bow window is going to also depend on whether you decide to opt for a bump-out alcove from floor to ceiling. This can have a significant impact on the overall appearance of the room, but it definitely adds to the cost of installation. You will need to consider flooring, drywall, and molding at a bare minimum as extra costs in addition to the labor. Unless it is tucked under the eaves of your house, you will also have to build a small roof over the top of the window. Once you add all the extras, your bay or bow window could easily cost up to $8,000 to install and finish completely. With energy costs rising, it is important to consider the cost in extra heating or cooling that may result from the installation of a larger window. However, if you are upgrading from less energy-efficient windows to Energy Star certified ones, you are almost guaranteed that your heating and cooling costs will not be adversely affected with either a bay or bow window. And, despite the larger surface area of your bay or bow window, you may end up saving on heating and cooling expenses. Bay windows will not work in every situation. For example, since a bay window extends out from the building by up to 2 feet, it may not be a wise choice close to a street or sidewalk. On the other hand, a bow window has a narrower profile, possibly as little as 4 inches and only 11 inches for an 8-foot wide window, making it a better choice when space is limited. If you spend the money for quality windows and expert installation, a bow or bay window is almost guaranteed to increase the resale value of your home. A beautiful, energy-efficient window, with sparkling glass and attractive window coverings, will instantly draw the eye and attract buyers. Whether it is a small bay window that accommodates a kitchen dining nook or a large, graceful bow window spanning a formal living room wall, the increased light and interior space created by installing a bay or bow window will help sell your house. 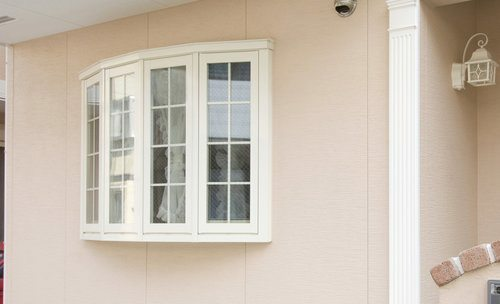 How much does it cost to install bay or bow windows in my city? Cost to install bay or bow windows varies greatly by region (and even by zip code). To get free estimates from local contractors, please indicate yours.